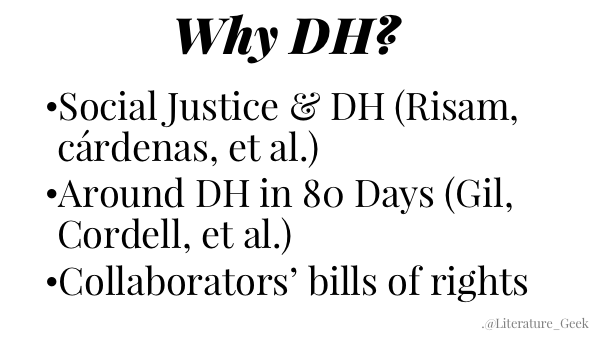 Why can DH be good for my work, for my department, and for my university? How can I get started in DH? 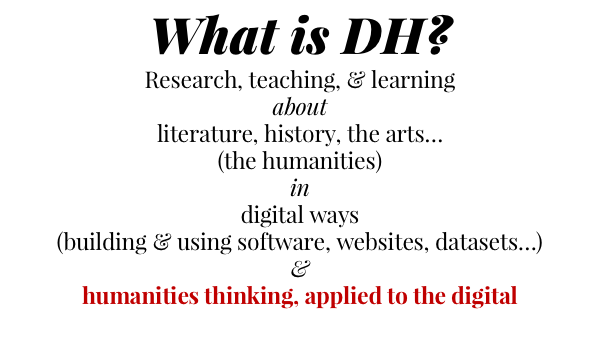 A nuance of this definition is that DH is not just about using digital tools and methods and formats in humanities work; it’s also about applying humanities thinking to the digital. For example, a DHer might think through what a feminist social media platform would look like, or look for the hidden interpretative work that goes into creating a shiny map of political opinions in America. What gets represented, and why? What gets elided and glossed over? Stewart Varner (in a great blog post) points out that the Viral Texts project led by Ryan Cordell and David Smith is a good example of this kind of DH. They’re using an algorithm to discover texts that were routinely reprinted in 19th-century historical newspapers—that is, discovering historical memes! After discovering where and how texts were reprinted and passed along among newspapers, they’re applying non-digital literary scholarship to studying why these texts were reprinted, and what their paths of dissemination might mean. A third nuance of what DH is, is that it’s as much about a distinct community and its values, as it is about DH methods and output (check out Matthew Kirschenbaum’s “What Is Digital Humanities and What’s It Doing in English Departments?”). DH is defined by communities of practice, whether those are of shared methods, research questions, values, or something else. I’ll show you some examples of those values in just a moment, but I do want to say that when I talk about DH community, my view is limited by my own experience, which has included a specific subset of DH using Twitter, and the projects and people at MITH, CHNM, Scholars’ Lab, the University of Victoria's DHSI, the DH Initiative at Hamilton, and other groupings where I’ve either worked, attended an event, or used a tool or project created by that grouping. Examples always help me, so I'll discuss three particular DH projects in more depth a little later in this talk. When I was getting started in DH, though, the thing that helped me feel like I had an understanding of this weird amorphous interdisciplinary field, was just to hear about a lot of different projects, and spend some time being gobsmacked by the many things doing DH could mean. So I'm going to zip through a handful of the many many things DH can be right now, before going into any level of detail. the University of Michigan’s team work on increasing digital access to Islamic manuscripts, where scholars have digitized texts' pages and commenters can add scholarly transcriptions and annotations to help others understand these texts. coding a WordPress plugin that translates blogs into Braille. I was on a team of DHers led by Tina Herzberg, George Williams, and Jen Guiliano, who realized that so much DH thinking is shared on WordPress blogs, and that creating some code that made blog writing simple to convert into Braille output could help in making the digital humanities more open. a project that explored digital ways choreographers could notate and preserve historical dance performances (team included Doug Reside and Elisabeth Kvernen). archaeological work excavating old buildings and recreating these lost locations as virtual 3D spaces (Nicolo' Dell'Unto) or recreating lost urban spaces such as the Soweto township under apartheid regimes (team led by Angel David Nieves). an event like the THATCamp unconferences, which started at George Mason University’s DH center (RRCHNM) and now take place around the world. These are events that try to bring DHers together to talk and build in less hierarchical ways than traditional humanities conferences do. a bot, such as Caleb McDaniel’s @Every3Minutes Twitter bot, which uses social media to hammer in the crushing regularity with which enslaved people were sold in antebellum America. DH can look at huge historical events, or it can look at large events alongside the every day, as with projects in the Black Press Research Collective (a team project founded and directed by Kim Gallon). The Collective includes work includes mapping and visualizing the historical availability of black newspapers, so that we don’t only know what was being written, but can also conjecture on who had access to reading that writing. For example, Matthew Delmont’s Black Quotidian captures moments of everyday black life from the past via historical newspapers. ...meta-work around the digital humanities field, as with Transform DH’s work toward a more diverse and inclusive DH. TransformDH is a decentralized network that includes work by Moya Bailey, Fiona Barnett, Anne Cong-Huyen, Alexis Lothian, and Amanda Phillips among others. ...the design of a platform like Mukurtu, which is a CMS (website platform) like Drupal or Omeka, but is explicitly built to ethically support indigenous communities in managing their cultural heritage. Mukurtu was started by members of the Warumungu community, Kim Christen Withey, and Craig Dietrich. Maybe you use traditional non-digital methods to do and print your humanities scholarship (as much as this Microsoft Word-loving field can be non-digital), but you're plugged into DH Twitter and find out about the latest projects, new blogged thinking, and future collaborators by being part of a digital community (for what it's worth, that seems to me to mean that you're doing some of your scholarship digitally). 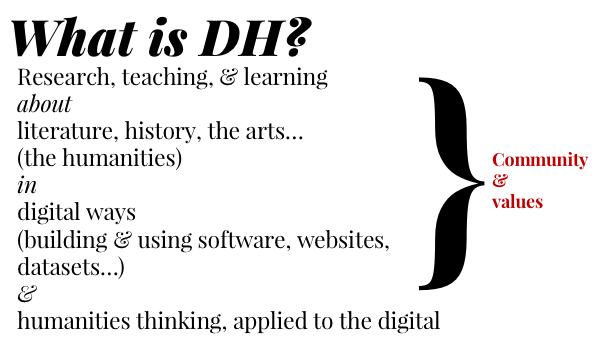 DH can mean that you actively use digital means to take part in your intellectual community. DH can look like many kinds of methods and/or publication forms, and those methods should be inclusive of all kinds of critical thinking and contributions to shared knowledge—things that don't always get credited as scholarship but should be, like coding, teaching, cleaning your data, building bibliographies, and documentation of how to use a humanities tool. 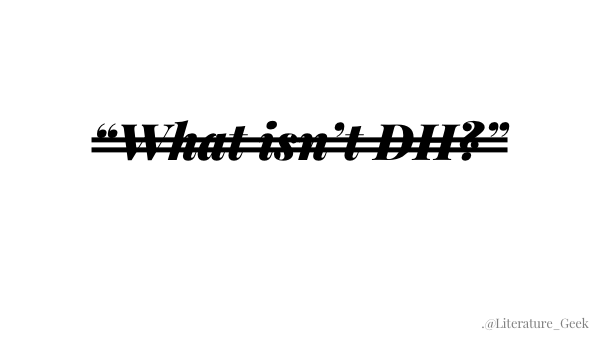 If all this can be DH, maybe we want to say, fine, what isn't DH? Despite arguments that the term DH isn't useful if we don't define it more rigidly than I have above—and maybe what I've said above, or any of the other 800+ definitions, should really be enough as a definition?–I just don't have much use for someone declaring whether someone else's work "is DH" or not, and have trouble imagining I wouldn't find such a declaration both wrong and disrespectful. But there are reasons to apply the term DH other than boundary-defining: sometimes we want to talk about some group of work in general, or about work for which we don't know whether the creator would term it DH, or want to say "I'd consider this project DH [implicitly expecting that anyone involved contradicted this, they have the last word]". Digital humanities isn't so much focused "just" on digitizing things. DH projects often don’t stop at scanning and putting humanities content like historical newspapers or photos online (although they could stop there and share their learning). Rather, DH projects often do so as a way to study or improve the process of digitization, or as a prelude to additional research. DH is often focused on designing inspiring and useful ways for interacting with those online materials, once they've been made digital. Digitization can be DH, just as much as coding, teaching, writing, performing, or many other possible methods of scholarship. Rather than bulk uploading of scanned documents, a DH digitization project might, for example, be concerned with figuring out the exact lighting and scanner settings to represent a scanned manuscript online, and the people doing this might speculate about what it would mean for a scan to be a more authoritative representation of the scanned manuscript, than if that manuscript were scanned with different lighting and settings. These scholars are asking, how do we best represent this physical thing digitally? What would “best representation” mean, and is there even such a thing, or is any process that involves choices subjective? People aren’t just robotically scanning and uploading stuff; even if they’re overworked and underpaid they’re developing expertise around this technical work. People care about the work they do and can’t help but think critically about the best ways to do it, and it’s weird and not useful to assume people working in the humanities in any role aren’t expert critical thinkers around the work they do. One thing I like about DH is that the community tends to be a little better at recognizing all humanities labor as the scholarship it is (versus "traditional" humanities), rather than glossing over the important, critical thinking and scholarship of people in many different professional roles (though it's far from perfect at this recognition, as I'll discuss below). So, asking if something is or isn’t DH might not be the most generative question (I guess it generated a bunch of words from my keyboard, though...). Instead, we may want to ask, what do DHers care about? And how can we encourage others to care about the same thing, when that's appropriate? I’ll talk a bit more in-depth about three DH projects now, to give you a sense of what some DH values look like in practice. 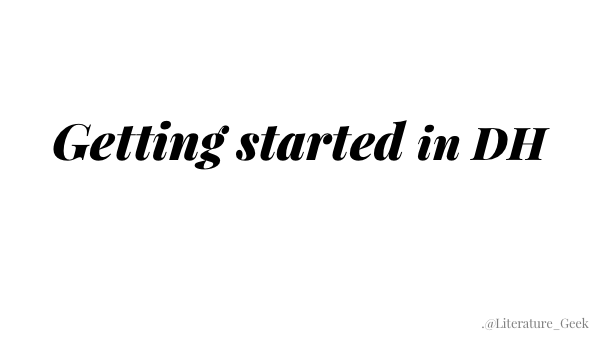 One of the trends I’m seeing in DH is a move from making things public, to making things participatory. 10-20 years ago, there was a big emphasis on just getting transcripts and scans of texts and images online, so people who couldn’t afford to travel to see the originals could nevertheless create scholarship around these things. These projects are great gifts to the world, and the critical thinking and decisions and experiments that went into them (and continues today with digitization staff) is DH scholarship. There’s a basic level of creating “access” to information, where someone’s scanned something and put it online where anyone can hypothetically access it. 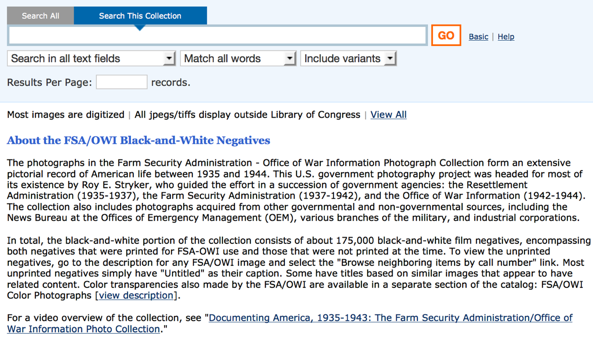 This is the case with the Library of Congress’ digitization and hosting of the thousands of photographs taken as part of government-sponsored programs during the Great Depression and WWII. These photos have been freely available online thanks to the LOC for years, and they give a wonderful view of what daily life was like all over the U.S. during this time period. But, the website is hard to use if you’re not used to working with research data collections every day—that is, if you’re not a researcher. And it doesn’t have tools or other design aimed explicitly at helping students and the public see why these photos are interesting and relevant to them. What the LOC staff have done (especially despite their past problematic management and with limited resources) is truly amazing scholarship, so I want to emphasize that this is awesome work, and I believe we need projects aimed just at researchers just like this project is—it’s just that I want researchers to be making more things that are aimed at people besides ourselves, also. The Photogrammar project at Yale, with a team directed by Laura Wexler, Lauren Tilton, and Taylor Arnold, is a great example of what digital humanities projects can add to the basic access allowed by digitized materials. Photogrammar is built on those thousands of Great Depression and WWII photos hosted by the Library of Congress (the FSA-OWI collection, 1935-1944 photos sponsored by the Farm Security Administration). What Photogrammar does, is to add an appealing interface that makes you interested in looking at these photos, then supports you as you start to have questions you’d like to answer about the photos. Additional tools on the site help you locate the photos that would be most interesting to you, and relate to what you’re teaching or learning. 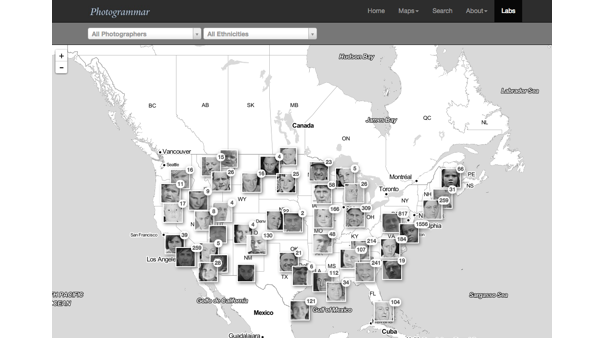 For example, above is a tool that uses facial recognition to identify people in these photos, and to let you explore and question where and when these photos were taken by the subjects’ ethnicities. Another tool lets you find commonalities and differences among subsets of the photos: like what kind of photos were most often taken in California between 1935 and 1945? I see the LOC 's project as representative of an earlier but still extremely important set of DH values: of getting stuff online in clean and accessible fashion; once more information is online, we can start to make it easier for people to do stuff with it, like Photogrammar does. Photogrammar is representative of a more recent value of DH: making the humanities not just more public, but more publicly inviting and participatory. 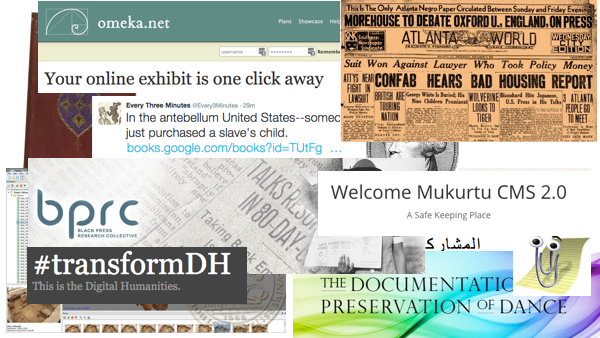 Documenting the Now is a DH project building ethical tools for preserving and including social media activism in the archive, with a focus on #BlackLivesMatter and related hashtags. 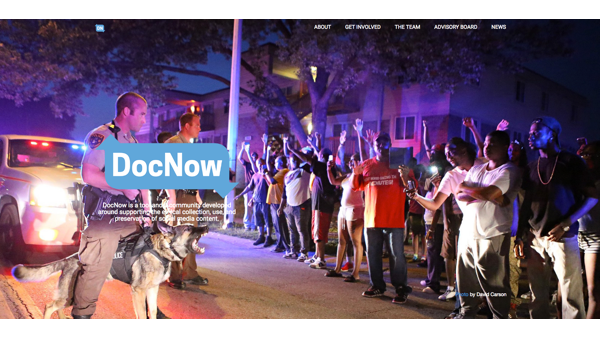 More than just a tool, DocNow is building a community around the difficult questions of ethically and respectfully creating a historical record of protests, including through a Slack (a chat platform) where everyone is invited to participate in conversations around archival ethics and design. DocNow’s community lead, archivist Bergis Jules, describes the project as trying to make the social media and web archiving conversation and work more inclusive, and says that might be the most important contribution of their project, even more than the tool they create. DocNow’s lead developer Ed Summers describes their work by saying: "I think what we are hoping to do is build a tool that doesn’t just do things because it’s possible, but has some values built into it”. This is an example of a couple things I like about DH, and optimistically think of as representative of DH’s values: they’re documenting their thinking and decisions, via blog posts and Slack, as they go along. They’re thinking about the shortcomings of technology: what happens to discussions happening on for-profit platforms like Twitter, where video links can break, tweets can be taken out of context, and people converse without consenting to becoming part of some institution’s record? They’re thinking carefully about the ethics of what they build and what others may do with what they build, trying to be not just legal, but moral. They’ve created a community space where anyone interested in these questions can participate in the conversation shaping the tool. And they’re working toward making the archive a better, more diverse, actively anti-racist record. 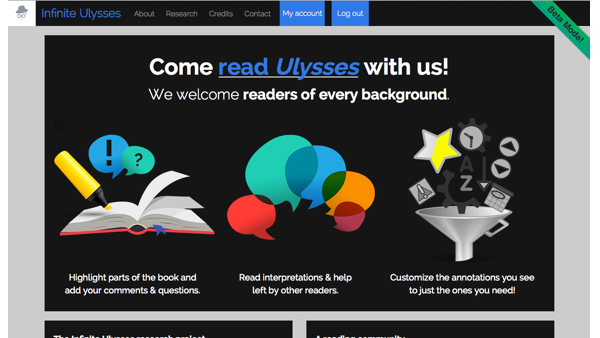 As a final example, one of my DH projects is a website that supports collaboratively reading and interpreting a really difficult novel, James Joyce’s Ulysses. Above is a screenshot of the front page of the Infinite Ulysses digital edition. 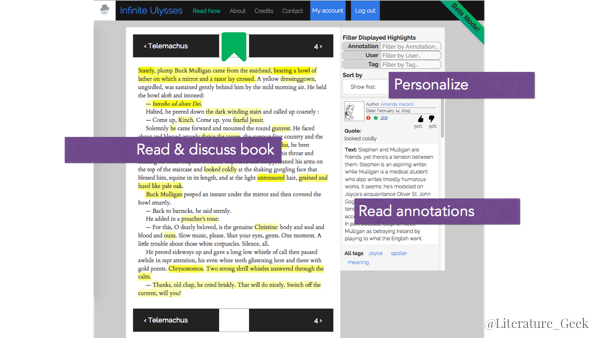 The images give a high level tour of the edition's features: you can highlight parts of the book and annotate those highlights; read others' annotations; and start to personalize what annotations you see to your background, interests, and needs on a very basic level. The goal of the project was to take a popular DH platform—the scholarly digital edition—and look at ways we can use visual and community design to invite, welcome, support, and value the contributions of non-academics in the conversations around challenging and complex literary texts. It was an experiment—I wasn’t sure what was going to happen and whether anyone would use the site. I also valued publicly documenting the design and technical choices I made throughout the project, and to not only discuss successes but also failures, like the time I spent 6 months working with a platform I ended up not using in the final website. I wrote a blog post twice a month to capture this information where others could read it. Increasing access can mean reaching out farther to collaborate with audiences that aren't as welcomed by the humanities. We want to think about the time and money required to engage with DH projects; about the bandwidth and hardware needed; about who gets to see themselves represented and spoken to. One of the failures I often hear ascribed to MOOCs, is that they don't actually open up learning to people who didn't already have some other option in terms of accessing higher ed resources. As happy as I am with how Infinite Ulysses has reached a variety of readers outside academia, of all ages and from around the world, there are two big things I’d like the project to do better. The first is to design to invite and support readers who don’t already have other alternatives for making their way through Joyce. And the second goal is to make this bigger than Ulysses: I was able to draw over 20 thousand site unique visitors because people have heard something about James Joyce and Ulysses, but it’s a big problem if what we create and encourage people to visit online just recreates the canon of print books (and a related problem that huge numbers of site visitors doesn't mean people who stay and enjoy the project). As much as I like Ulysses, I want to figure out what readers on my site like about the novel, and then point them to less-canon texts that do similar things. When I talk about why you might want to be involved in the digital humanities, I tend to speak toward the good and ideal of DH, and the DH I want to see. 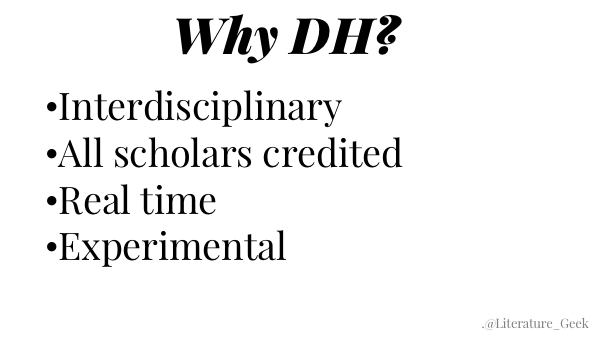 But DH isn't some magical anomaly. It’s a community of people from a lot of fields, with a lot of subfields of its own, and it shares many of the same problems as humanities fields, something the #TransformDH hashtag and Tumblr are working on. I encourage you to check out the Twitter hashtags on the screen for some useful conversations around problems in DH, including issues at the yearly big DH conference that took place last week—the #DHdiversity hashtag (archive captured by Ernesto Priego) documents a series of panels and talks identifying ongoing issues of sexism, racism, ableism, and other marginalizations in DH and at our conference. People who are marginalized and in precarious professional roles are still overly called to testify and labor for improvements within DH. And DH is getting big: the yearly DH conference last week drew 902 participants from 45 countries, but diverse representation is lagging behind the realities of who does DH. Projects actively working to make DH better in this regard include Roopika Risam and micha cárdenas’ Social Justice and DH project; Alex Gil, Ryan Cordell, and others’ Around DH in 80 Days (which highlights DH centers and projects from around the world); and the Off the Tracks Collaborators’ Bill of Rights and UCLA A Student Collaborators’ Bill of Rights (which both lay out how to ethically credit and celebrate the labor of everyone involved in a DH project). As much as I like to work toward what I want my DH to be, I don’t want to give anyone the impression that DH is some utopia. It’s not better than other fields, but it has in its favor some more ways for people to regularly, actively move the field to be a little bit better at a time. 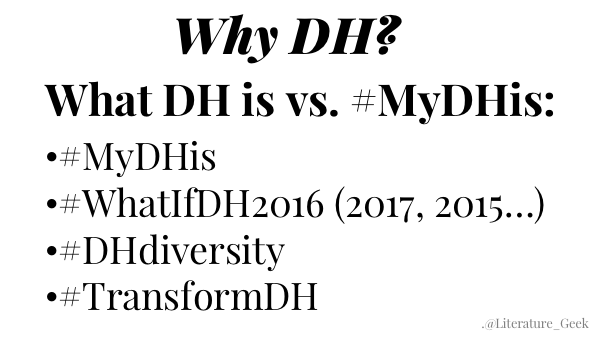 The #MyDHis hashtag captures people speaking about their visions for what DH should value; the #WhatIfDH2017 and previous years’ hashtags capture suggestions and provocations challenging the next year’s big DH conference to be better than this year’s. As real-time: I love being part of a community where I can ask a question on Twitter or the DH Slack and hear a bunch of ideas in the next few hours. As valuing sharing what you learn, without needing to be an expert: I was able to get started doing some very basic information visualization work and blog about what I did. Even without being anything ever near an expert in information visualization, I’ve heard from people who were also able to get started in infoviz by reading my blog posts. (If you're interested in information visualization and analysis, one place to start is Miriam Posner's blog (getting started, infoviz and ethics for historical research, infoviz lesson plan, Palladio tool) and Scott Weingart on when networks are inappropriate. I did a very DHy dissertation that didn't have any chapter writing; instead, I was able to spend some time thinking through the best methods and publication formats for pursuing my research question and sharing what I learned. It turned out that designing, coding, blogging, and user-testing what I'd built were the best ways for my research to go. Being linked into the DH community was a big part of successfully being able to do that as my dissertation, instead of doing one traditional dissertation, and a whole extra DH project that wasn't officially counted. The DH I've encountered is open to rethinking how what we value as scholars can look, given today's knowledge and opportunities. I tend to see people not feeling enfranchised to call themselves digital humanists, not feeling enfranchised to call themselves scholars, not feeling enfranchised to call all their critical efforts research. So I tend to emphasize these labels to counteract imposter syndrome, people being undercredited, people not getting opportunities to situate their work as intellectual labor. I also want to recognize that there are negative results of this habit: not everyone is or wants to be called a digital humanist or a scholar or a researcher, so I absolutely do not want to say someone is any of these things, if that's not how someone identifies themself. Moya Bailey at Northeastern recently gave a great talk here discussing the pros and cons of strategically leveraging the phrase "digital humanities", and I'd encourage you all to check out her work. She emphasized that choosing to label yourself or your work via DH can open opportunities for funding and publicity and community, but identifying with DH can also close doors or make others expect certain things about your work, or turn away scholars who are not interested in or are resistant to digital scholarship. 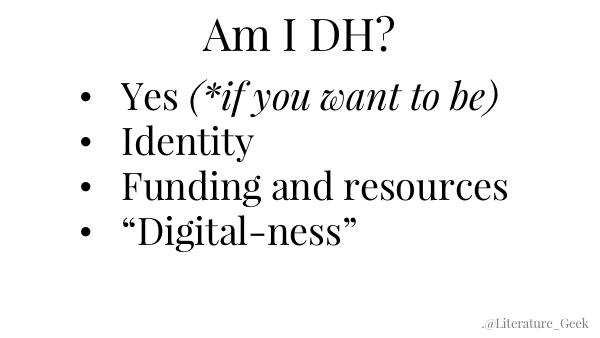 So maybe what you do, or want to do, or the community you want to join or create, isn't DH: you can still make use of DH-labeled resources, but choose to identify yourself and your work in a variety of ways, and attend a plethora of DHy conferences beyond the main huge DH event. I encourage people starting with DH—especially students looking to take on a DH project but also complete their coursework or dissertation—to remember that prototyping is an option. That is, you can have a research question and imagine an ideal digital method or tool or presentation format to pursue that research. To then document the critical thinking that went into your brainstorming design, to list problems you foresee or storyboard how someone might engage with your idea, to get out your colored pencils and sketch your tool, or use some other way of wireframing or prototyping what you're imagining—and then share all that with your community, is scholarship. It absolutely contributes to communal knowledge. It isn't some magical requirement that you go on and code the idea yourself, though you certainly can embark on learning how to do that—having a specific project in mind does wonders for making tutorials stick in your brain. And learning about cod,e or other pieces of realizing a DH project, helps you understand issues, limitations, opportunities you might not have seen otherwise. Or, understand why DH has treated some opportunities as low-hanging fruit and others as blue-sky wishes. But you can also leave that scholarship to a collaborator—coding and building are useful methods, but they are just some of many methods out there, and nobody needs to take all of them on. Many DH projects are necessarily collaborative, because they require many skills and no one person is likely to offer expertise for each. You can work in DH without needing to do everything yourself, and without being an expert in coding or a digital method; maybe your contribution is historical knowledge, or being great at locating information online, or designing, documenting, user testing, or publicizing, among many other options. 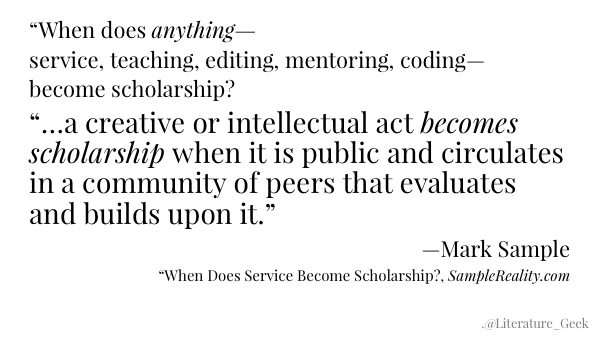 Mark Sample has a fantastic blog essay on the question: “When does service become scholarship?”, in which he says his answer to that question "is simply this: a creative or intellectual act becomes scholarship when it is public and circulates in a community of peers that evaluates and builds upon it." One of the things I like most about DH, is that practitioners tend to recognize and reward scholarship in its many methods and forms. Scholarship isn't bounded by what your professional title is or whether you create something that looks like a book or journal article. I see DH as not just about openness to many methods as ways to think critically and share those thoughts, but also as a movement to recognize meta-activities such as project management and documentation as scholarship. So my biggest reason why DH can be good for you, for your department or unit or university, is that it usually comes with a culture of valuing all kinds of effort. I do want to recognize that some people don't want to identify as scholars or their work as scholarly; when I speak of scholars here, I mean everyone who's interested in doing their best thinking and sharing the results of that thinking with others, whether you're teaching, developing a library unit workflow, coding, writing, or another method. On a personal level, it can make a useful difference in how you feel about your job and your work, if you start to value all of your effort as part of being a scholar, or feel enfranchised to identify as a scholar or researcher. Identifying with DH opens up an interdisciplinary community that, while in no way perfect, is at least sometimes better than traditional academic departments at a couple useful things—and when it fails, we at least more often have public discussions about that failure, and these at least more often can slowly improve our community (e.g. when the big DH conference had all-female keynote speakers this year, and the #DHdiversity hashtag was used extensively to identify ongoing problems and suggest improvements). DH tends to welcome newcomers a little more, in part because it's the norm for someone with years of experience in some academic field to be new to a digital method, or vice versa. DHers use the term "alt-ac" (#altac) to refer to "alternative academic" positions, which are career paths that satisfy your desire to work as a scholar while recognizing that tenure-track teaching positions are extremely limited in number, and that many excellent researchers who would like to have such a position just can't, in terms of position availability. There's some really good blogging about DHer alt-ac experiences, including the #alt-academy mediacommons project. It might not seem like a big deal to be aware of related types of job if you're coming from interdisciplinary library science, but often humanities PhDs come out of their dissertations without being aware of career options other than tenure-track teaching. Besides the obvious digital skills involvement in DH can help you develop, related abilities like being able to work well with a team of people with different interests and backgrounds, and having experience in project design, management, and grant-writing, are all skills DH projects can model. At the university level, DH's emphasis on interdisciplinary collaboration, methodologies over content, and recognition that all academic fields deal with history of the field, ethics, subjective interpretation, design, and texts will help us connect libraries and liberal arts units to other campus communities including STEM departments. I’ll finish up with some resources for getting started in DH. 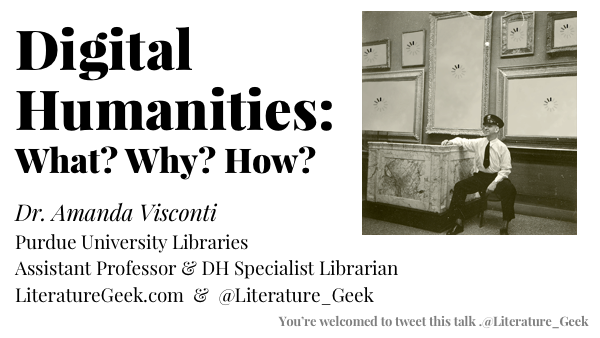 I’ll talk briefly about where to ask questions and find foundational resources online, where to publish and read current DH work, doing DH as a job, and arguing about DH. 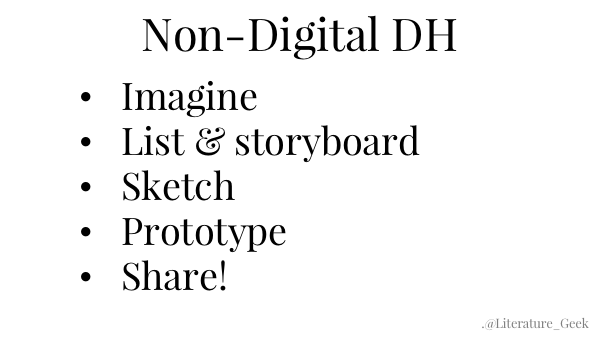 These are a combination of things you can do to get involved in DH, either where you are (depending on local resources) or online. Does your library have a DH, digital scholarship, or other "digital something" librarian or unit—someone who doesn’t also happen to be you? If not, I'd still recommend asking around if your colleagues have consulted or collaborated with anyone on campus doing DH. Student and staff working groups and book clubs are another option—if there aren't any where you are, you might use a campus listserv and put out a call for anyone interested in meeting to chat and work through reading a solid DH resource such as the Debates in the Digital Humanities series (which is free online, and offers timely argumentative pieces about the shape and future of DH). I've seen some people come at DH by taking a term they keep hearing—say, Drupal websites—and deciding to learn that thing. Having that focus can work well, but I find you're more likely to be successful if you get a little help at the start in choosing a tool or method that's actually the best fit for your interests (Drupal, for example, can do cool things but is a headache to maintain, so you only want to use it when you need features other options don't offer). If you can find someone in-person or online who's involved in DH, ask if they'd be willing to point you in the right direction given your interests, whether that's a specific research question or imagined project, or just the desire to learn how digital methods could support your love of Victorian dime novels. It can be hard to ask strangers online for help, and I know people involved in scholarly organizations who are thinking through making virtual mentoring a good option. In the meantime, safer places to ask for direction or advice include the DH Q&A forum, and the DH Slack (which is like a set of DH themed chatrooms, with currently over 700 members and a code of conduct). 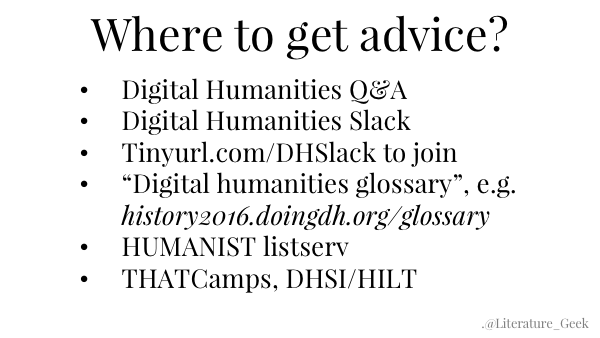 The DH Slack has a number of channels (or themed chatrooms) for asking any level of DH question, for students wanting to discuss fitting DH into their studies, for self-identified beginners, and for people interested in seeing the kinds of jobs and conferences currently available in DH. I run the Slack, so if you’re curious about joining or participating, but have questions or would like suggestions for getting involved, please feel free to tweet at me (@Literature_Geek) or send me an email (viscount@purdue.edu). 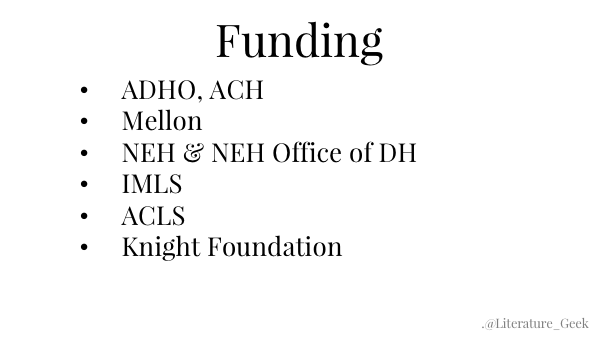 If you have a project idea that needs funding, DH funders including Mellon, the NEH (National Endowment for the Humanities and especially the NEH Office of Digital Humanities), and IMLS (Institute of Museum and Library Services) often post example grant proposals or successful past proposals, which can be useful in shaping your research or discovering precedents in a subfield, even if you're not applying for a grant yourself. If you are interested in grant funding, though, you should know that some regular DH funders—the NEH Office of Digital Humanities definitely, and I believe also the IMLS?—have amazing program officers willing to read through and comment on your grant proposal, if you ask for feedback before the actual grant submission deadline. DH Now is an aggregator of DH online content; I use it to hear about new blog posts on DH topics, but it also aggregates DH events, CFPs, and job openings. You can follow via Twitter or RSS feed. But DH now isn’t just a good way to hear about DH, it’s a good place to get started in DH social media. You can volunteer as an editor of DH Now, which means that during a specific week you’ll curate a feed of incoming content from a huge set of DH blogs and websites, and recommend the best stuff for sharing. This is a great way to get an overview of who you might want to follow on Twitter or who’s doing work related to your interests. Another option is The Programming Historian website (I should note that I’ve just joined the site’s editorial team last week because I like the project so much—so I’m biased, but for a good reason). 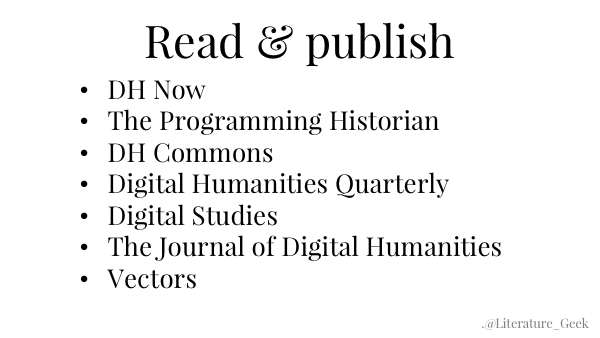 The Programming Historian offers peer-reviewed, novice-friendly lessons on DH tools and methods; it’s not only pitched at the right place for someone who wants to learn a skill but doesn’t already know other digital methods; each lesson tries to explain why a humanities researcher might want to use the tool, and how. In addition to being a good place for learning, it’s also a place to do peer-reviewed publication of DH lessons and tutorials. If you need peer-reviewed pieces for promotion or tenure in your job, this can be a way to get credit for skills you already know, while at the same time mentoring others you want to learn those skills. DH Commons is both a platform for sharing DH projects and volunteering as a collaborator for things like beta-testing new DH work, and also an online, peer-reviewed journal. This journal supports submitting peer-reviewed publications of two DHy types: you can submit DH project statements (explanations of the work that went into your DH research) and you can submit “How did they make that?” pieces (explaining the tech/design/methods that went into making what you made, based on Miriam Posner’s highly recommended blog post of the same title). Vectors, a journal for publishing multimedia work in DH and related areas. I believe they take all kinds of DH pieces (websites, visualizations, etc.) but may have a preference for things authored using the Scalar tool? 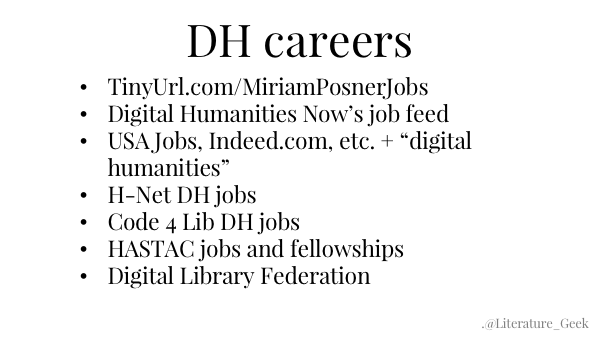 Even if you're not interested in a DH job yourself, keeping abreast of recent DH job ads can give you a better sense of how different DH subfields and tools cluster—you'll see what kinds of tools DH archivists are using, what history professors are using, and be better able to point others in the right direction for getting involved in DH. And if you are thinking about a DH career, being aware of the language in DH job ads can help you tailor your learning toward a specific role. Using general job search engines like USA Jobs or Indeed.com with “digital humanities” as the search term is more hit and miss, but you can set things up so they email you whenever a job matching DH appears on their sites. If you're interested in government DHy jobs (e.g. NEH ODH, IMLS, Smithsonian…), besides searching by institution on the USA Jobs site, you can follow NEH ODH Senior Program Officer Jennifer Serventi on Twitter, where she periodically shares these humanities-focused jobs (for example). If you start to see a lot of projects that fit your interest coming from one DH center or department, it can’t hurt to follow their website's RSS feed to hear about new job openings. And when you apply, remember that DH gives you particular skills beyond technical ones, and you should demonstrate these skills to potential employers: the ability to handle project management (even more, often for projects with less precedents than usual precedents in academia! ), experience with collaboration and interdisciplinarity, and learning to communicate in voices suited to multiple audiences and with relevancy for who you're talking to. Lastly, I wanted to say a bit about arguing to do DH. If you run into trouble with someone preventing you from doing DH work (e.g. saying you can't use your professional development funding to learn a DH tool, or that you can't satisfy coursework with digital scholarship), you can help you argument in a couple ways. You might develop a concise statement or elevator pitch, using no specialist/technical language: maybe one paragraph on what your final deliverables will look like (to help people picture what you'll do), and one paragraph explaining why your digital methods or format are the best way for exploring and communicating your research. It can also help to assemble a list of precedents for your work. When I was arguing that I should be able to design and code a digital edition for my dissertation, for example, I pointed to work by established scholars like Alan Galey, whose Visualizing Variation project uses code to make arguments about early modern textual scholarship. I also looked for examples both of similar methods and formats; in my case, my committee pointed out that literature departments have a history of allowing a print scholarly edition as a dissertation. I also looked to pre-digital precedents in my subfield: textual scholarship—the people who create scholarly editions of texts—has a long history of using design and building to perform arguments (e.g. the Victorian editor Teena Rochfort Smith created an experimental prototype of Hamlet with typography so innovative it would have been impossible to print at scale at that time). A lot of the rejection of digital scholarship hinges on it being "different" from non-digital scholarship, so showing the ways digital scholarship is a natural successor to research widely recognized as scholarship is a useful tactic (not "digital vs. traditional", but "digital vs. non-digital"). As I hope I communicated earlier, DH is not perfect. DH has a lot of areas where we can greatly improve as a community. 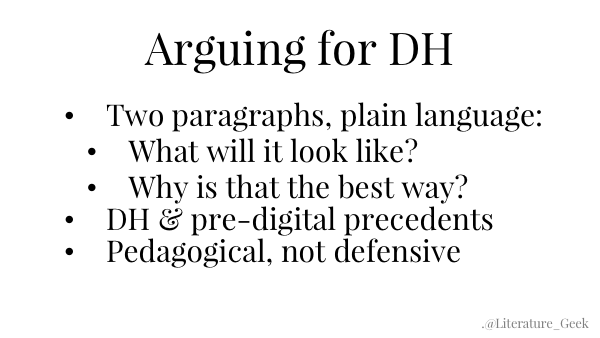 That said, I don't want to overemphasize the issue of needing to argue for DH as scholarship. Instead of predicting that my DH work will meet with resistance, I try to design my work to invite understanding, by doing things like showing its continuity with past non-digital work, and making sure I'm careful about defining technical terms. From just my particular point of view, I can say that presenting DH pedagogically rather than defensively has been great at helping me communicate with people not involved in DH. Thank you to organizers Jason Clark, Oliver Bendorf, and Sara Mannheimer, as well as to the DLF eResearch Network members for being a great audience! Also, a big thanks to Élika Ortega and Stewart Varner ("What DH Could Be") for changing how I present on and define DH. The #DHdiversity, #MyDHis, #WhatIfDH, #TransformDH DHers are also awesome and have helped me be a better DHer and person. P.S. I can't find the original creator of the GIF on my first slide (museum gallery with framed loading icons). Let me know if you know—I'd like to credit them!